The new John Lewis range is fun, playful, practical and stylish. There are lots of coordinating pieces in the older girls range which means the girls can mix and match. I love it when they’re slightly “matchy matchy”! Caitlyn wears a retro inspired “Sunshine” t-shirt in pale dusky pink. It’s perfect to brighten a sunny day. She teamed the Sunshine slogan tee with Blue Floral Shorts. The shorts are comfortable and practical enough for this adventurous girl to climb and explore. They have a pretty floral pattern and could be worn with a Broderie Tee and sandals for an evening stroll too. Rebecca wears the same pretty floral print as Caitlyn but on a Spaghetti Strap Playsuit. Again the playsuit is comfortable and practical, perfect for the beach and coastal walks. It could be teamed with a hoody on cooler days. The playsuit could also be dressed up for evenings with sandals and a classic cardigan added to keep the shoulders warm during the evening breeze. Rebecca also chose a Floral Woven Sun Dress for evening holiday wear. The teens and older boys range has both comfy everyday casuals and smarter summer shirts. Danny loves comfort while travelling so he chose this cool and comfortable relaxed weekend wear. The marl short sleeved hoodie is made from a super soft cotton blend, short sleeves, a hood and a kangaroo pouch pocket. The grey sweat shorts combine comfort and style and can be teamed as easily with a tee as with the matching hoodie. 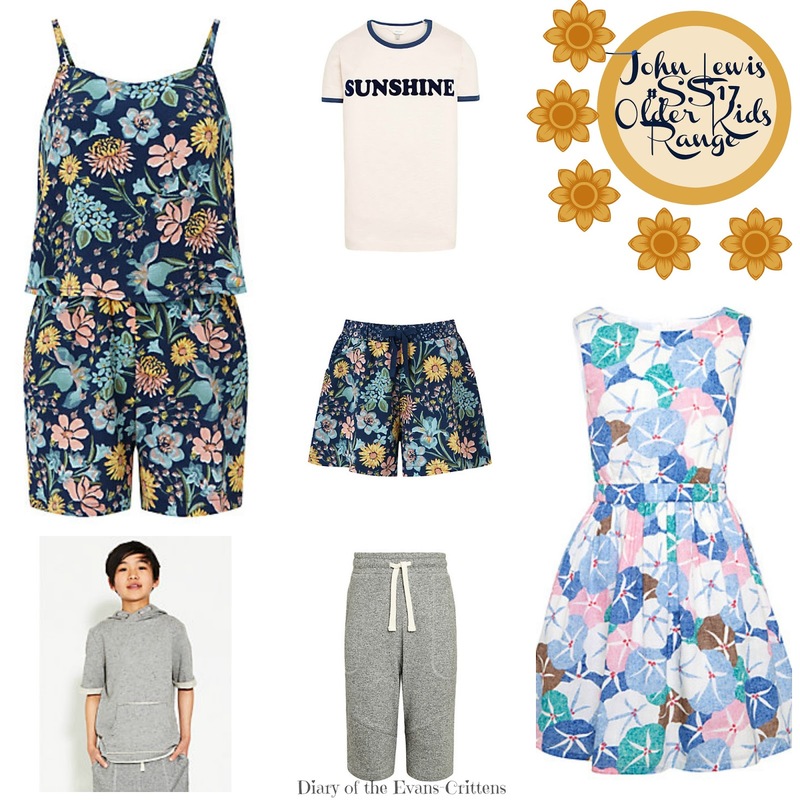 We are very impressed with the John Lewis Teen and Older Kids Spring and Summer Range. They have everything that older children and teens will need from swimming costumes, summer clothes, shirts and dresses to raincoats and all in a fashion led style designed by the in-house designers. Which are your favourites from the new range? We were sent the above items from John Lewis for the purpose of review. This post contains affiliate links.